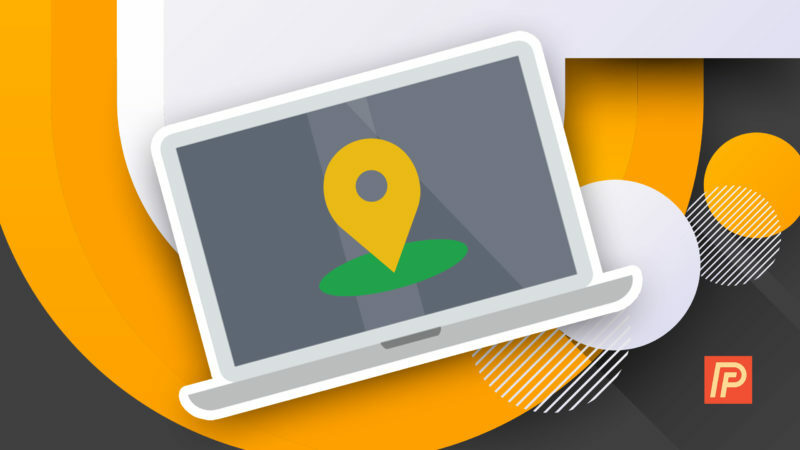 You are at:Home»iPhone»Location»How Do I Find My iPhone From A Computer? The Easiest Way! You keep your friends close, and your iPhone closer. Even if you’re careful, it’s possible for your iPhone to go missing. Whether it’s lost in a pile of laundry or making its way across town in an Uber, it’s good to know how to find your iPhone from a computer. In this article, I’ll show you how to use Find My iPhone from a computer so you can find your missing iPhone, right away. 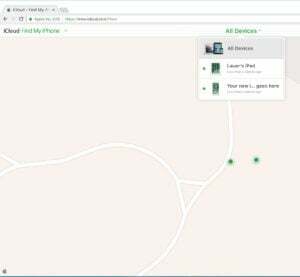 Find My iPhone allows you to find your iPhone, Mac, iPad, iPod, or Apple Watch when they’re lost or stolen. You can find them using the Find iPhone app on your iPhone, iPad, or iPod, or you can use your computer to locate your devices — more on that in a second. How Does Find My iPhone Work? Find My iPhone works by using Location Services (including GPS, cell towers, and more) on your iPhone to show your iPhone’s location on a map. There are other cool features available online that can help you find or secure your iPhone. But more about those in a minute. How Do I Use Find My iPhone From A Computer? To use Find My iPhone from a computer, go to icloud.com/find and log in with your Apple ID and password. All of your devices will appear on a map. Tap All Devices at the top of the screen to view a list of all the devices that have Find My iPhone turned on and are linked to your Apple ID. Tap on the name of each device to play a sound, put your device into lost mode, or erase your device. Once you’re in, you’ll see a map with a green dot that shows you the approximate location of your iPhone, iPad, or iPod. As long as it’s set up correctly, the service even works for finding your Apple Watch or Mac computer. That’s pretty amazing! Wait! Find My iPhone Isn’t Working! You can check if Find My iPhone is enabled this by going to Settings -> iCloud -> Find My iPhone. In this menu, make sure the switch next to Find My iPhone is turned on. If it isn’t, just tap the switch. It should turn green, letting you know it’s enabled. While you’re there, I highly recommend making sure Send Last Location is also turned on. 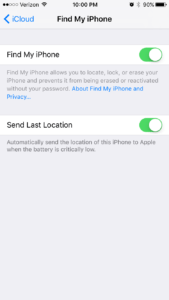 This allows your iPhone to automatically send Apple your iPhone’s location when the battery is running low. That way, even if the battery dies, you can find out where your iPhone is (as long as no one moves it!). If Find My iPhone is set up on your iPhone and it’s online but Find My iPhone still isn’t working, check out your Location Services tab. Location Services should be enabled for Find My iPhone. To check this, go to Settings -> Privacy -> Location Services. Scroll through the list of apps until you get to Find iPhone. This should be set to While Using the App. If it isn’t, tap on Find iPhone and select While Using the App. Voila! 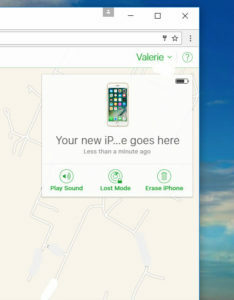 Find My iPhone from a computer only works if the iPhone is online. If it isn’t, the iCloud website will have a gray dot next to the iPhone’s last known location. You can set up the program to tell you the next time your missing iPhone goes online. Just click the All Devices drop down menu, and choose your iPhone. Now there should be a box in the upper right-hand corner of the browser window. That’s where the magic happens. If your iPhone is offline, you can check the box next to where it says Notify me when found. That same box has a few other fun options. You can set off an alarm on your iPhone from the web browser page. Just choose Play Sound. If your iPhone isn’t lost in the couch cushions and the alarm doesn’t help you find it, you can use this website to put your iPhone in Lost Mode. Lost Mode lets you display an alternate contact number on the iPhone’s screen, so if someone finds it, they can get it back to you. But if all of these features aren’t helping, or you think someone may have taken your iPhone, you can erase your iPhone from the same page. Just choose Erase iPhone. Next time your best digital friend goes missing, I hope this tutorial helps! Using Find My iPhone from a computer is an easy way to keep your iPhone safe and make sure you’re reunited with as little drama as possible. Have you misplaced your iPhone before? Did using Find My iPhone from a computer save the day? Tell us about it in the comments section below. We love to hear from you! Previous ArticleMy iPhone Won’t Sync! Here’s the Real Fix.